Recently we were contacted by Brittney, owner of B's Marketplace, a local market here in Hogansville. She approached me with the idea of capturing what they do and sell at the market, but also to capture their family in a candid and interesting way. We knew that she had a ton of cute props for us to use, so we took advantage of that… plus her produce was really nice looking — all locally sourced! Their little market was really well decorated so we wanted to make sure to display that as well. If you're in the area, you need to go check it out! Now, one of the challenges was lighting. We were trying to figure out how to use the quickly fading sunlight combined with the flash to produce the best results. And since the sun is constantly moving, especially at sunset and behind big trees, we needed to be quick! Not so easy when you are working with a big softbox. Ok. Let me tell you how much we enjoyed working with this lovely family. They are extremely nice and friendly, making our work easy. We talked about what they wanted, and then as the photoshoot went… Brittney holding baskets of peaches, Jake toting containers full of tomatoes and Drake carrying a big and heavy watermelon on his shoulder, it all worked out. Another challenge when taking pictures of more than one person, is the angles. You need to work with an angle that works best for everyone, and still keep the lighting in mind. Next step, editing. Most people don’t know how much work editing takes. For this photoshoot we were looking for a magazine editorial style, since Brittney told us they were needing pictures for a local magazine. So we wanted bright colors, and a lot of light in the faces to make them pop. Thank you Brittney, Jake and Drake for trusting us to take your pictures. It was fun and we really enjoyed working with you…also, those peaches were so yummy! If you're interested in doing a photoshoot with us, shoot us an email. Our Art on the Walls. 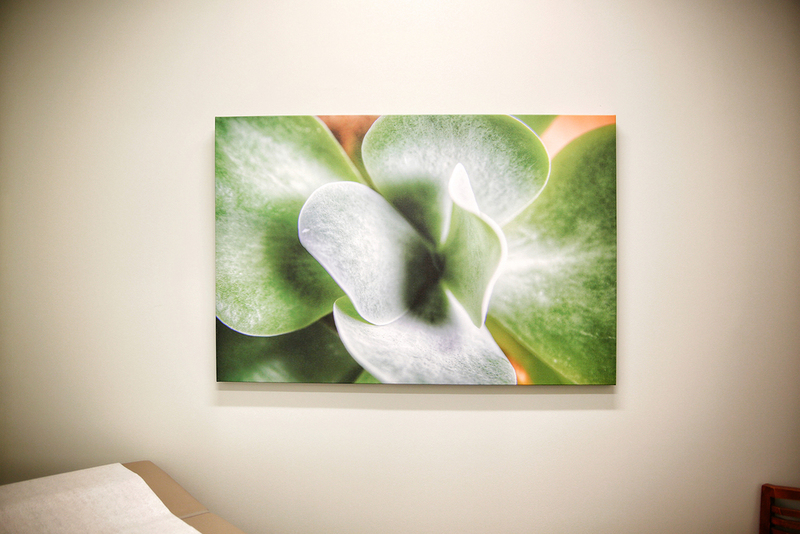 We recently completed an exciting design/photo project with a local health clinic, Summit Urgent Care. They approached us with the idea of adding "life" to the many empty walls of their new clinic and at the same time, keeping it simple. They wanted to break away from the typical sailboat prints and inspirational quotes. We decided to go with nature, showcasing vitality in a center of health, because nature gives you endless possibilities and it's always attractive to your eyes. Next step was to create unique images, showing in detail the beauty behind a flower, a succulent or a simple leafy plant. The photo capturing process was like this: we would go out and take pictures after it had rained...drops everywhere made for some of the best images. Other times, we would stage some river rocks, spraying them with water, and playing around with lighting, because sometimes the idea is in your head but you have to tweak some things to make it happen. 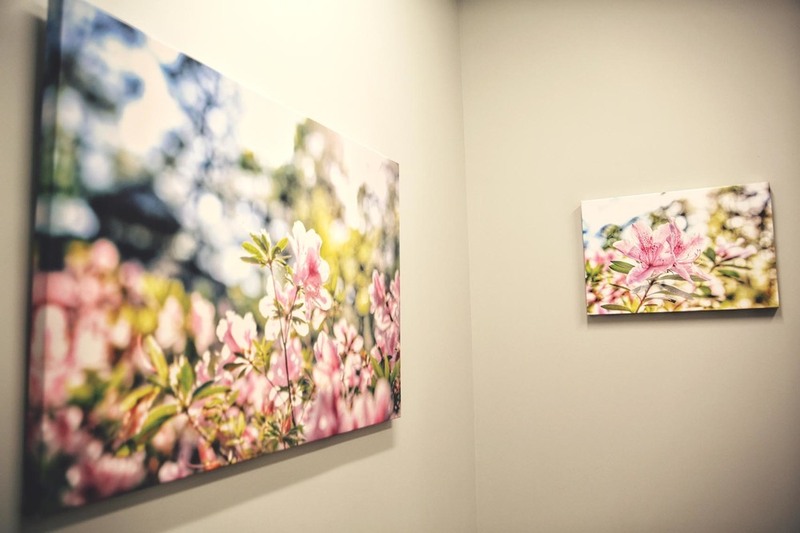 We tried to keep in mind exactly what our client was needing — they will be putting these images in exam rooms, many of them, so we decided to create "Series". Three or four pictures of the same object but showing different perspectives. 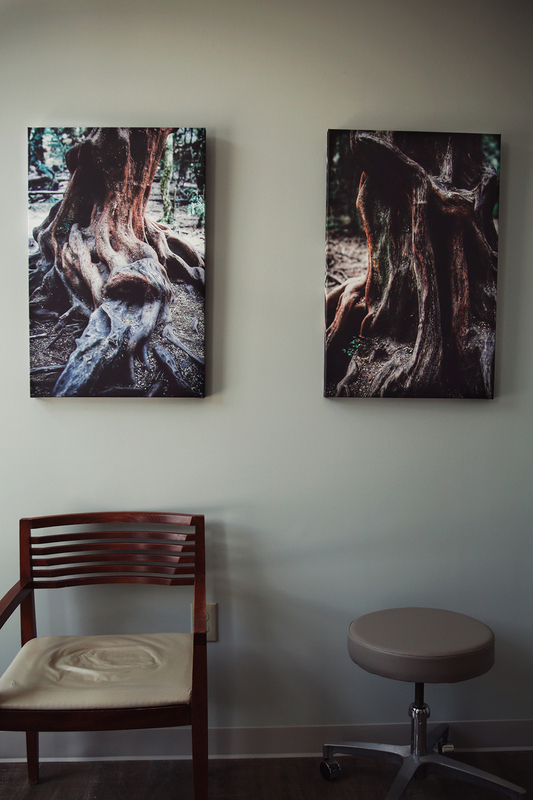 So while a patient is in a fairly small room, they would have a “nature story” to keep their mind off the wait. The first part of this process completed — we took these images to the post-production studio. We wanted to keep the images looking as natural as possible, but we also wanted to highlight the details, and the overall beauty of each of them. Creating impacting images that jumped off the walls. Once we had our edited selection of images, we started the process of printing. Some of them were canvases, some of them were printed on aluminum. All of these were done by a high quality printing company, giving us great looking results. 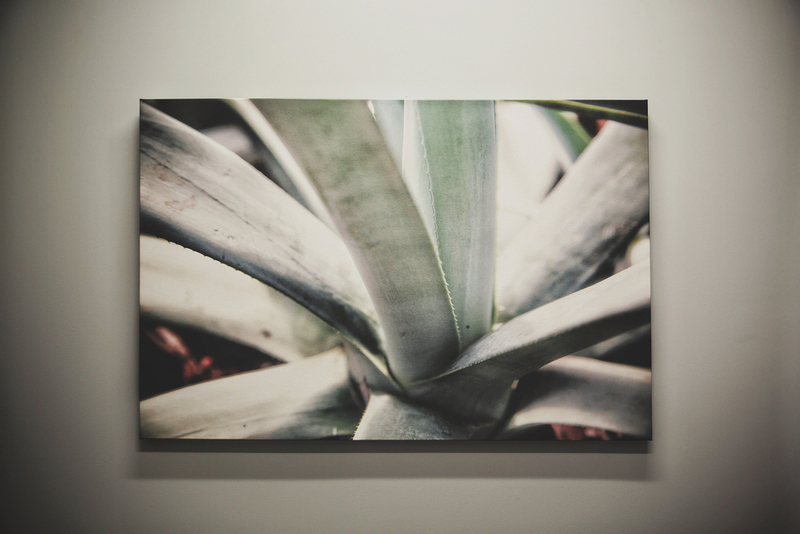 Once the prints arrived, we worked with the designer to find the perfect spot for each image. In the next few weeks, after the opening of the clinic, the feedback rolled in. The patients loved the pictures! Some patients wanted to buy them off the walls! We are pretty excited about this project and it was really nice to work with Summit Urgent Care. We are currently working on new images for their Clinic in Newnan. If you would like to purchase some of these prints and more Click here to see our store. Mara & Maca Di Salvatore. Recientemente hemos completado un emocionante proyecto de diseño y fotografía con una clínica local, Summit Urgent Care. Ellos se acercaron a nosotras con la idea de añadir “vida” a las tanta paredes vacías de su nueva clínica, pero al mismo tiempo querían mantenerlo simple. Querían salirse un poco de los típicos cuadros y frases inspiracionales. Entonces decidimos elegir la naturaleza como nuestro objeto, mostrando vitalidad en un centro de salud, porque la naturaleza de infinitas posibilidades y es siempre atractivo a los ojos. El siguiente paso fue capturar imágenes únicas, mostrando en detalle la belleza detrás de cada flor, suculento o una simple planta verde. El proceso de captura de las fotos fue así: salíamos afuera a tomar fotos luego de que lloviera…las gotas por todos lados nos dieron algunas de las mejores imágenes. Otras veces, organizaríamos algunas rocas, las rociaríamos con agua, y jugaríamos un poco con la luz, porque muchas veces la idea esta en la cabeza pero hay que trabajar para conseguirla. Tratamos de tener en mente exactamente lo que nuestro cliente estaba necesitando —ellos pondrían estas imágenes en los, muchos, consultorios, así que decidimos crear “Series”. Tres o cuatro fotos del mismo objeto pero mostrando diferentes perspectivas. Entonces cuando un paciente se encuentra en una habitación pequeña, tendrían una “historia de la naturaleza” para distraerse de la espera. La primera parte del proceso completada — llevamos estas imágenes al estudio de post-producción. Queríamos mantener estas imágenes luciendo lo mas natural posible, pero también queríamos acentuar los detalles, y la belleza de cada una de ellas. Creando imágenes únicas que resaltarían de las paredes. Una vez que teníamos nuestra selección de imágenes editadas, empezamos con el proceso de impresión. Algunas de estas eran impresas en lienzo, otras en aluminio. Todas ellas fueron realizadas por una empresa de impresiones de alta calidad, dándonos excelentes resultados. Cuando las impresiones fueron entregadas, trabajamos junto con el diseñador para encontrar el lugar perfecto para cada cuadro. Y en las semanas siguientes, cuando la clínica abrió, tuvimos reacción de los pacientes. A ellos le encantaron tanto los cuadros que algunos querían comprarlos ahi mismo! Estamos muy emocionados por este proyecto y nos dio gusto haber trabajado con Summit Urgent Care. Actualmente estamos trabajando en nuevas imágenes para su clínica en Newnan. Si estas interesado en adquirir algunas de estas impresionas y mas Haz Click Aquí para ver nuestra tienda. We discovered that we had an interest in photography over six years ago. We remember visiting the local art museums where iconic images were displayed from all over the world. These images inspired us and filled us with wonder. The element of photography that excites us is to see beyond the normal form, seeing beyond the day-to-day, the mundane and building that into a unique and timeless expression of art. Our passion grew more and more which lead us to photography school, where we learned the fundamentals of the craft. This passion continues to grow everyday unto the point where we joined together in the U.S. to start our very own photography studio. Our main focus is based on getting better with practice and dedication, experimenting in every aspect of photography. We believe everything has their own unique essence that is waiting to be captured—from the face of a child to a simple flower. This leads us to search for every little detail; expressions and languages inspiring us to capture and to transmit them. 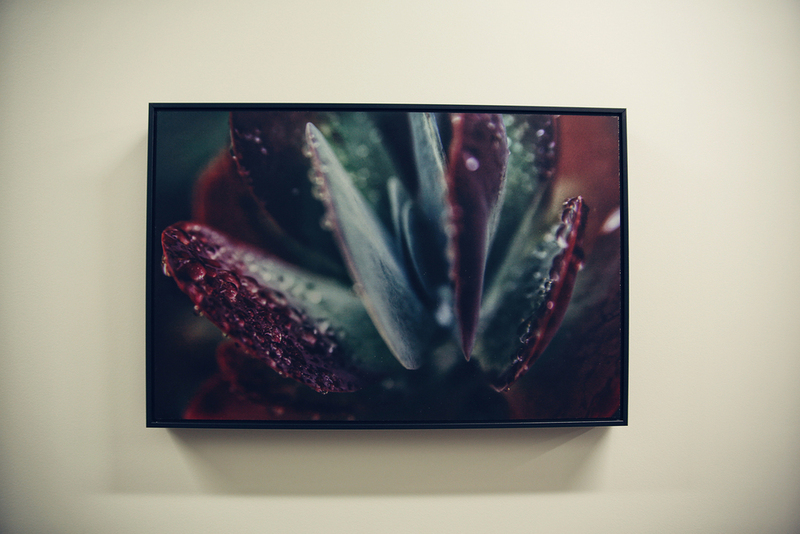 We've had the opportunity to open our own photography studio.. We also have an online STORE where you can purchase canvas prints from a selection of our photographs. We continue to work on new projects, and brainstorming ideas to add to our portfolio. We hope you join us on this long journey we have ahead. Déjanos contarte un poco mas acerca de nosotras..
Hemos descubierto un gran interés por la fotografía hace más de 6 años. Recordamos ir a visitar los museos de arte local donde imágenes icónicas de todas partes del mundo eran mostradas. Estas imágenes nos inspiraron y llenaron de curiosidad. El elemento de la fotografía que nos emociona es ver mas allá de lo normal, viendo cada detalle del día a día, de lo mundano, y a construirlo en una expresión de arte única y duradera. Nuestra pasión creció mas y mas, lo que no llevó a la escuela de fotografía donde aprendimos los fundamentos de este arte. Esta misma pasión continua creciendo día a día, hasta el punto en que nos juntamos en los Estados Unidos para comenzar con nuestro propio emprendimiento fotográfico. Nuestro enfoque principal se basa en mejorar con practica y dedicación, experimentando en todas las areas de la fotografía. Creemos que cada cosa tiene su propia única esencia, esperando ser capturada—desde el rostro de un niño hasta una simple flor. Esto nos lleva a una búsqueda de detalles; expresiones y lenguajes inspirándonos a capturarlas y transmitirlas. Hemos tenido la oportunidad de abrir nuestro propio estudio fotográfico.. También tenemos una tienda online donde puedes comprar impresiones en lienzo de nuestra selección de imágenes fotográficas. Continuamos trabajando en nuevos proyectos, y pensando ideas para agregar a nuestro portafolio. Esperamos que nos acompañen en este largo camino por recorrer.